S.S. United States won't sail again. Can she be saved? I had a feeling it was too good to be true. 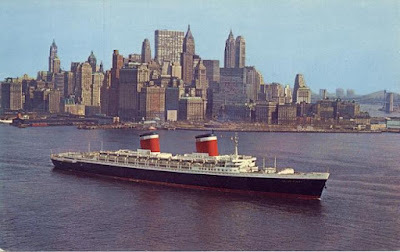 As I noted in my earlier post, the cost of making the S.S. United States suitable for use as a cruise ship, including hazardous substance remediation and removing her steam turbine engines and replacing them with diesels, would prove prohibitively expensive to her prospective owners, Crystal Cruises. Now my misgivings have been confirmed. In my previous post I opined that the cruiser conversion was likely the Big U's last chance to avoid the fatal trip behind towboats to the beach in India where she'd be cut to bits like an enormous stranded whale. 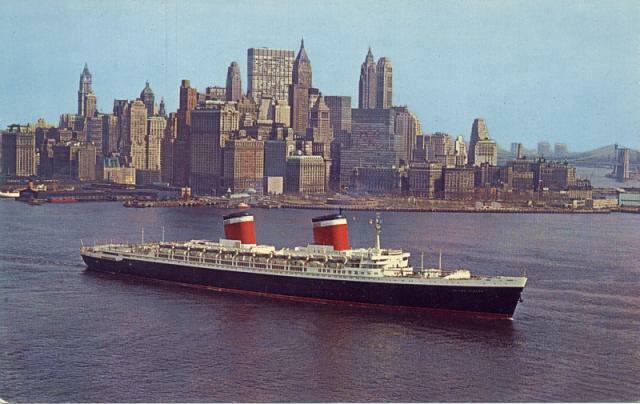 The story linked above notes that Crystal will donate $350,000 to the SS United States Conservancy as a good will gesture to help with the ship's preservation. Proposals to bring her to New York, possibly as a hotel, a museum, or just a static display, are still being considered. The cost of doing that wouldn't be nearly as great as for making her a cruise ship, but they would still be substantial. I'm hoping one or more of our local grandees will see the value of bringing back this part of our city's history, and that the fate Oliver Wendell Holmes feared for "Old Ironsides"--"The harpies of the shore shall pluck/ The eagle of the sea"--will not befall S.S. United States.